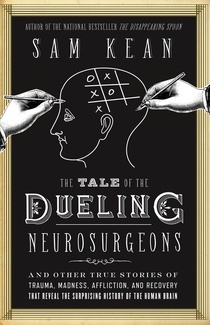 For those of us who are dealing with the effects of cognitive impairment and physical neurological damage in our journeys through dementias and Alzheimer’s Disease either as caregivers of loved ones or as actual participants, The Tale of Dueling Neurosurgeons: The History of the Human Brain as Revealed by True Stories of Trauma, Madness, and Recovery by Sam Kean should be on our reading list. Each chapter covers a section of the brain, its functions, and how defects change not only that section of the brain, but the behaviors associated with it. Reading this will give us some excellent insights into the behaviors we see when dementias and Alzheimer’s Disease are present. I always believe that our ability to help and respond well and lovingly with any health issue, including neurological decline, is directly proportional to how well we understand what is happening and why. “Sam Kean has done a great job of not only showing the history of neurosurgery (all the way back to the 16th century) but also how a handful of people in the space of about 400 or so years discovered key basic biology and functionality of the brain. Historically, brains have not been treated well and people with neurological defects (birth, genetic, or circumstantial) has fared even less well. Reading this, you can’t – unless you have no heart at all – feel anything but a whole lot of empathy for the people whose neurological defects gave us more understanding about how the brain works. Except for the discussion of kuru in Papua New Guinea. If getting completely grossed out in detail is your thing – it still makes me shudder and I skimmed over the worst of it as soon as I read the first offending description – you probably won’t mind. I mind. A lot. It’s just too yuck for words. Otherwise, a very well-written engaging and informative book. And it’s accessible and conversational. As much as I love the study of neurology and neuroscience, as I actually do biology and medicine, I apparently, though, still have that little glitchy hangup with the dissection/surgery/”Ewwww…I have to touch THAT?” part that goes along with it.